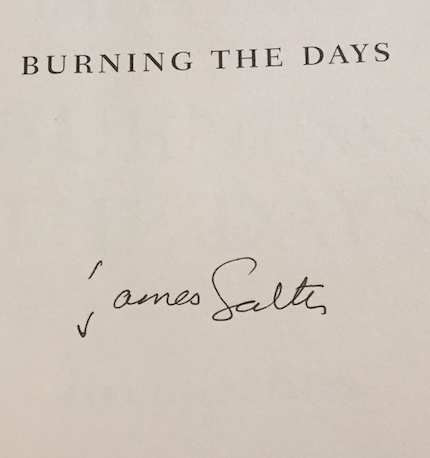 James Salter died today at age 90. I think he might be one of the most under-read and under-decorated greats of American literature. Like many other readers, I'm still slowly discovering him, but find that everything I've read has been nearly perfect. All That Is, James Salter’s first novel in thirty-five years, follows the life of Philip Bowman through the middle decades of twentieth-century America. When the novel opens, Bowman is a junior naval officer in World War II amidst some action in the Pacific. The novel expands episodically: we next see Bowman a returned hero in New Jersey, then studying at Harvard, and eventually in Manhattan, getting his foot in the door of a publishing house. Bowman consistently takes what he wants when he wants, from his career to the women he sleeps with. He’s an unusual hero to follow, as Bowman’s American Dream is whatever the best thing is in front of him. This is a masterful work of subtle complexity: Philip Bowman is a difficult, new mind in a familiar trajectory, finely tuned with deficiencies most authors would overlook. We, as readers, see Bowman’s decisions to be just as poorly planned as his previous infidelities: he vies for the unattainable because he’s already tried his luck with the immediate vicinity. But somehow Bowman is oblivious to his history of social and romantic carelessness. And, it’s with this in mind that one can return to the title of Salter’s novel and ruminate on the author’s carefully succinct, properly tensed wording. Bowman lives entirely in the present and allows no past regrets or ambitious aspirations to distract his day-seizing vivre. Salter’s handling of eroticism in All That Is is an extension of this hedonistic slant but is often executed at the expense of the reader’s enjoyment. Bowman’s actions between the sheets are in step with the brash decisions he makes outside the bedroom and are justifiably, frustratingly in character. One could stretch a connection from Bowman to Rabbit Angstrom or Nathan Zuckerman, but their sexual exploits are much more affirmative and often celebratory than Bowman’s empty, mirthless lovelife. All That Is could even be read an experiment in the anti-Roth, or anti-Updike: what happens when the glory days are removed from the mid-century American male’s identity? It seems only success is left, devoid of any gratification. Having only read about four of his books, I can say that Salter was one of the best. 90 years is a long haul but it's sad to see him go.